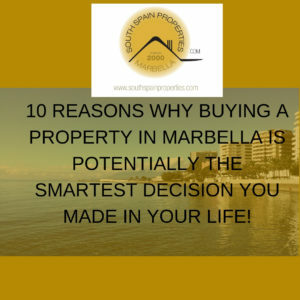 10 Reasons Why Buying a Property in Marbella is Potentially the Smartest Decision you Made in Your Life! 1. Marbella first of all is exclusive , what we mean by that is its pretty expensive! 2. Marbella name is synonymous with rich and famous around the world. 3. Marbella benefits from a unique microclimate in the whole of Europe with mild winters and mild summers! 4. People who know Marbella, would agree Marbella also has a Micro-Economy which has not much to do with the rest of Spain! 5. Marbella has some of the best world class golf courses with highest number per kilometre! 6. Puerto Banus, luxury port of Marbella with some of the most luxurious yachts in the world and world class brand designers is the place to be if you have cash to flash! 7. In Marbella exists some super size palaces belong to kings, princes and princesses of the world, yes if you come across long walls and no gates, possibly flooded with security cameras you are going passed one of them! 8. How cool are the stars of Marbella? Antonio Banderas himself the great actor of El Mariachi, Mask of zorro and many more movies lives here, in one of the most exclusive mansions in Marbella. 9. Marbella boasts high number of blue flag beaches, meaning clean and with adequate amenities. 10. Marbella boasts also some of the most exclusive hotels in the world including Marbella Club Hotel. 11. Marbella´s habitats are 50% foreigners , that is from UK, French, Germany , and the rest of the world, its like United nations ! 12. Marbella hotels are expensive as a result, when you have a holiday home in Marbella, if you wish to earn some money from your property when not used by yourself, the income is quite high. 13. Due to Marbella´s popularity, re-sale value of properties are high, Location , Location , Location! 14. Marbella is not only for millionaires, there are also some fantastic holiday homes in Marbella for less than a quarter of Million Euros, available! And if you notice I said 10 reasons but Marbella is so great that I came up with 14 reasons!